The original Star Trek series was originally marketed as “Wagon Train to the Stars,” after the popular 1957 western, Wagon Train. 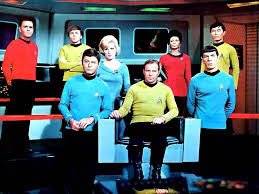 Star Trek: TOS aired from September 8, 1966, to September 2, 1969. The show was a way for its creator Eugene Wesley “Gene” Roddenbery (1921-1991) to comment on contemporary issues through the guise of science fiction. In the Star Trek universe, Zefram Cochrane developed faster-than-light warp drive around 2061 and conducted his test flight to Steppenwolf’s Magic Carpet Ride. “Red-shirting” became a Star Trek slang word for an extra who was killed to demonstrate the danger the main characters were in. The extra almost always wore a red uniform.b In tribute to the original series' “red-shirting,” red-shirted Chief Engineer Olsen in Star Trek (2009) meets his death during an orbital sky dive onto a drilling platform while Kirk and Sulu survive. The only official intoxicant served in TNG's Ten-Forward is Synthenol, an artificial booze that loses its inebriating effects the moment a crew member leaves the bar. Although Roddenberry was actively involved in the Star Trek animated series' conception and production, he did not consider them to be “canon” or part of the established history for the characters he created. Besides the Trill, Vulcans are the only other known humanoid in the Star Trek universe who are able to transfer one individual’s consciousness into another's (known as the “mind meld”). Actress Majel Barrett Roddenberry is the only actor to be in all Star Trek incarnations, including the animated series and films.b Before her death in December 2008, she completed the voice of the computer in Star Trek (2009).